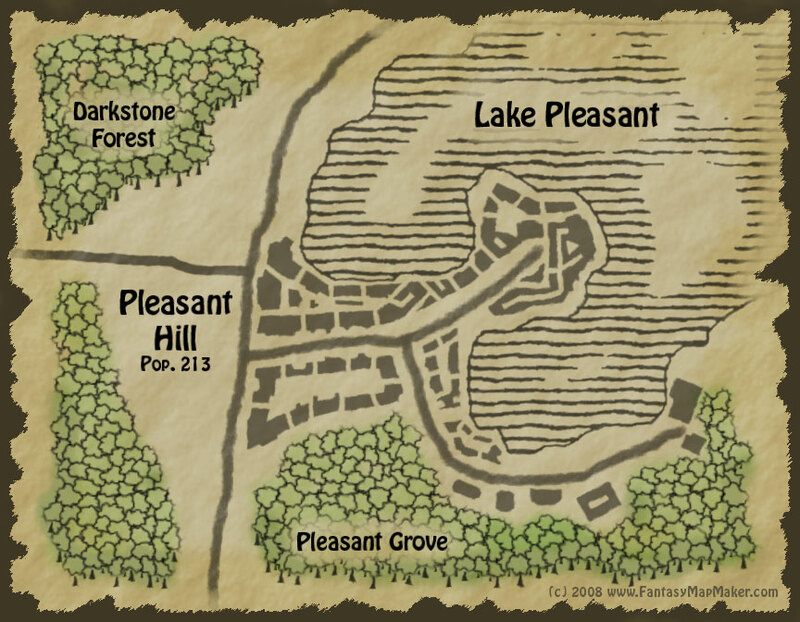 Pleasant Hill is my first attempt at mapping with Adobe Photoshop. I was trying for a hand drawn style and I’m pretty happy with the results, though I think next time I’ll try to make the paper more wrinkled and give it better defined edges. What do you think? This map was made by following Butch Curry’s excellent Fantasy Cartography with Adobe Photoshop podcast series. If you have Photoshop (not cheap!) and want to make fantasy maps, this is a must-see tutorial. I learned a lot – not only about making maps, but also about Photoshop techniques in general. This map was made with Adobe Photoshop. This is amazing. I don’t have photoshop so I don’t know what it can do, but this looks sick. I was wondering if you take requests for maps. My listed website could use your assistance if you’re willing to help. You can contact me directly at my e-mail address. Hi Joe, I can’t promise anything or commit to any deadlines, but email me the details of what you need and maybe I’ll give it a shot. Looks fantastic. I’ve also been following along with Butches podcast series and find his instructions easy to follow and have wicked outcomes. Still working on my own however. Looks great, keep up the good work. LOOKS SICK!!! I DREW UP THIS DANK WIZARD CHARACTER WHO NEEDS TO POPULATE A WORLD I WAS WONDERING IF YOU COULD MAKE MY VISIONS COME TRUE. THANKS MAN KEEP UP THE GOOD WORK!!! My hometown is Pleasant Hill, California. This is probably what it looked like a 100 years ago… Great job!